Brussels has been quite gray and cold lately, the kind of weather where it’s pouring down, but too windy to rely on your umbrella not doing that inside out thing umbrellas will do. This morning it’s been raining and hailing, but with super bright light and patches of blue sky all the same. Today is Saturday, and for some reason I’ve been craving eggs for a few days now. I must be low on vitamin B or something. So I woke up and decided on a whim to try my hand at poaching eggs. Again. 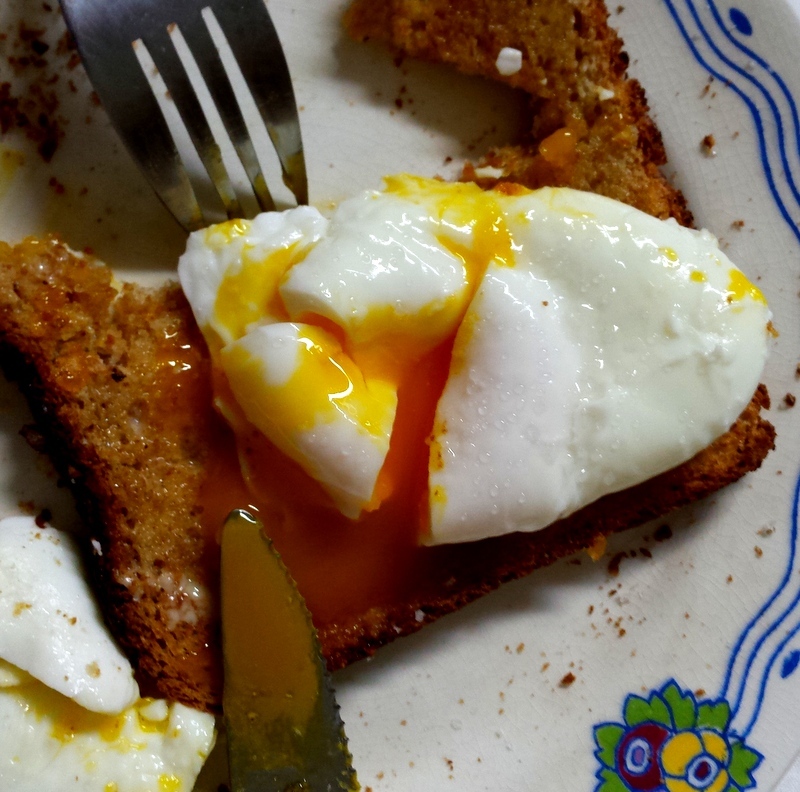 My previous success rate when it comes to poaching eggs is about one in three, which has been very frustrating. I’ve tried all the different recommendations: super fresh eggs, a wide shallow pan, a few inches of water, either a rolling boil or a gentle simmer, swirling the water with a wooden spoon to create a vortex into which you drop the eggs, adding vinegar to the water, using a small bowl to drop the eggs into the water, not using a bowl to drop the eggs into the water, leaving them on the heat, or taking the eggs off the heat and covering with a lid, even a special egg-poaching device (that one was a complete failure let me tell you). Today I was like, no thank you. So I got out a saucepan, added a few inches of water to said saucepan, put it on the stove top at a high heat with the lid on, and waited for the water to come to a rolling boil. When the water was boiling, I turned the heat down low so that the water was still gently bubbling, and then cracked two eggs into the pot (about an inch apart to keep them from sticking to each other) and began debating with myself as to whether to swirl the water. I decided to wait, for a minute or so (I’ve found that sometimes the swirling will actually make the egg whites spread and create those straggly bits nobody wants?). Some of the egg white sort of spread out and clouded the pan, and so after about a minute I gently swirled around each egg with the handle of a wooden spoon. All the extra egg white that had clouded the pan wasn’t actually sticking to the eggs, and the whites seemed well distributed around the yolk.. well here goes nothing, I thought to myself. 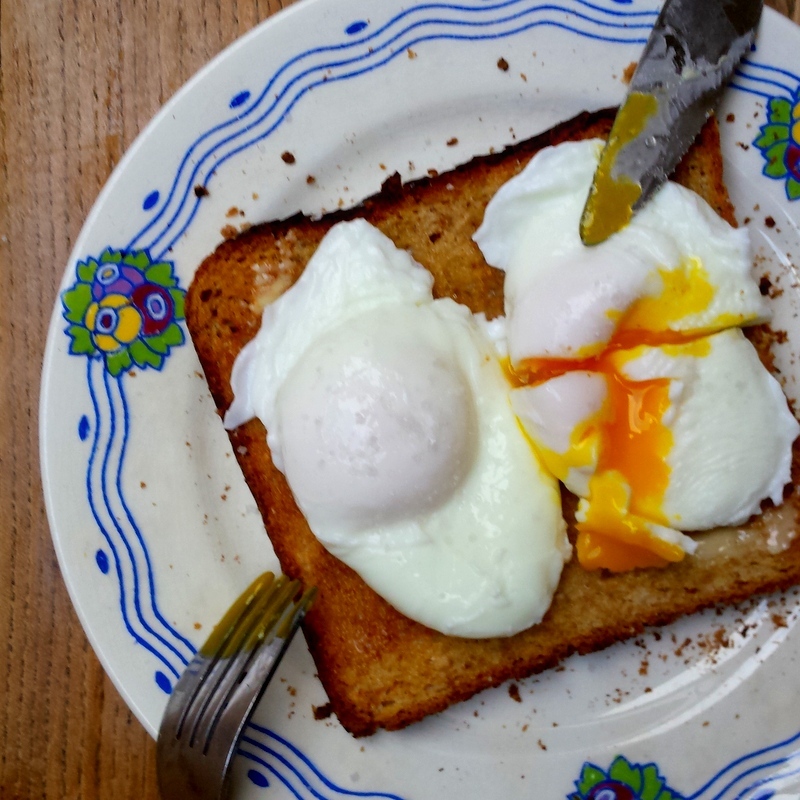 After about 2 minutes I gently fished out one egg with a slotted spoon, to check how done it was, put it back into the pot for about 30 seconds, then fished out both eggs, leaving them to dry on a plate covered in kitchen roll for about 20 seconds while I buttered my toast. 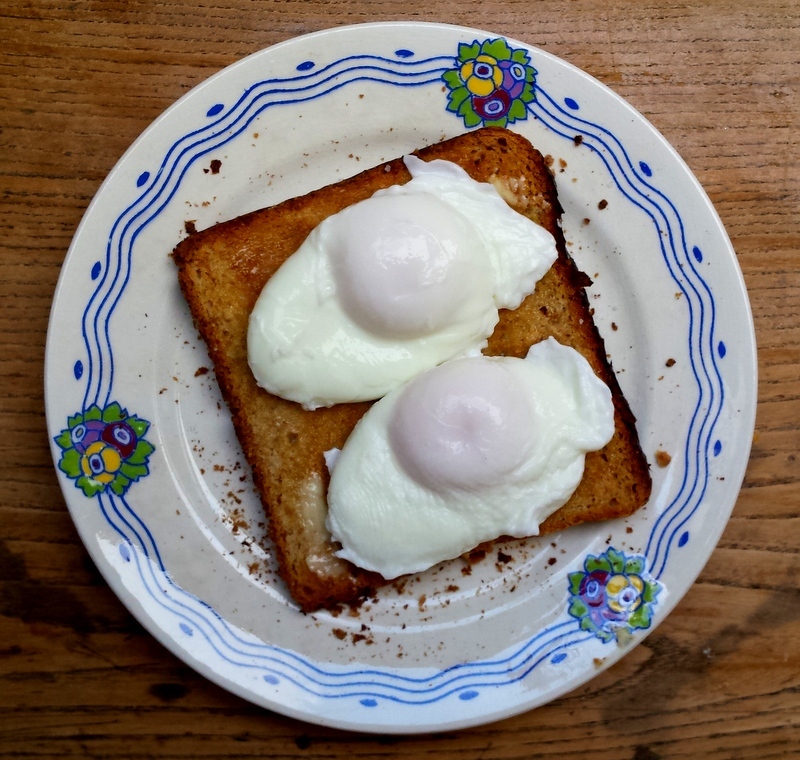 And lo and behold: these are the best looking poached eggs I have ever managed to make. None of those weird straggly bits of egg white, just even, perfectly poached eggs. And I wasn’t stressing about how much to swirl the water, or creating the perfect vortex to drop the eggs into. Just a few inches (more or less) of boiling water, two eggs, a bit of swirling once the eggs have settled into the water, 2-3 minutes (depending on how set you want the whites to be – I am ALLERGIC to gloopy egg whites – just use a slotted spoon to gently fish out the egg and check that the whites are nice and opaque) and a short rest on paper towel once done, just to absorb the water sticking to the egg. I shall report back once I’ve tried this again, but I have a really good feeling about it! And it took less time than boiling an egg! Next day update: I’ve now successfully made a second batch, and whilst they were slightly less even-looking (but only very slightly, and I think this is because I attempted four at the same time and got a bit overwhelmed with the swirling), and I slightly overcooked the yolks (they were still yummy and runny though, but one can never have too much runny yolk, and very easily have too little, in my opinion), they still worked out just great! So I’m definitely sticking with this method of poaching eggs 🙂 Happy Sunday!